NY Times Excerpts From "The Obamas"
The New York Times has excerpts from the the book, "The Obamas." 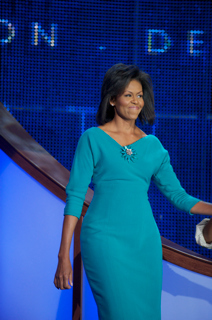 The book, which will be published Tuesday, devotes many pages to the role of Michelle Obama. Shorter version: She gets frustrated with her husband's staff at times and she is Obama's biggest supporter. So what else is new? 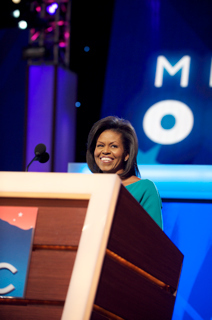 One week from tomorrow, Michelle Obama may be the First Lady-Elect of the United States. 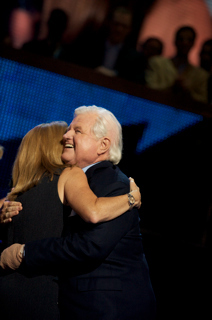 Here she is on the Tonight Show this evening with Jay Leno. (Part 2 is here.) She'll be in Colorado Springs tomorrow afternoon for an early voting rally. 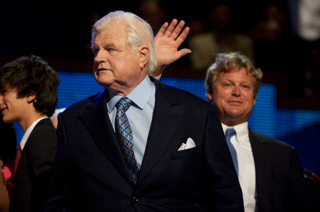 Michelle Obama is on Larry King Live tonight. She seems very relaxed and conversational. I'm starting to picture her as our First Lady. I think she'll be a terrific role model. She has so much more to offer, and is so much more interesting, than Cindy McCain. Michelle Obama says she was not offended by John McCain's "that one" comment during the debate. I've never watched an entire episode of the View (or Oprah or Ellen or any day time talk show.) But, I'm going to give it a shot today to watch Michelle Obama. I'll post my reactions (not a live transcript) here. Noon ET: The show begins, updates below. The New York Times presents the new Michelle Obama. The campaign, as I noted here, has been carefully re-working her image since the end of the primary. The new Michelle is softer, less lawyer-like and the focus is on her past successful efforts at helping minorities, both African-American and Latino, and working to better race relations. ....her husband’s presidential campaign is giving her image a subtle makeover, with a new speech in the works to emphasize her humble roots and a tough new chief of staff. On Wednesday, Mrs. Obama will do a guest turn on “The View,” the daytime talk show on ABC, with an eye toward softening her reputation. 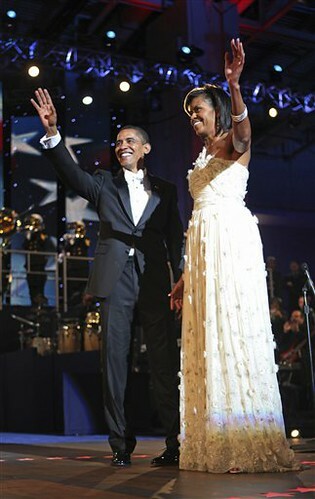 Barack had a more bohemian attitude toward romance. “We would have this running debate throughout our relationship about whether marriage was necessary,” Obama told me. “It was sort of a bone of contention, because I was, like, ‘Look, buddy, I’m not one of these who’ll just hang out forever.’ You know, that’s just not who I am. 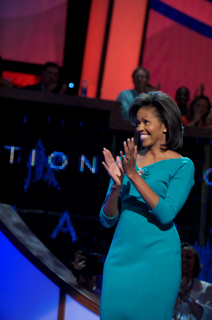 We had a miraculous victory in Iowa," Michelle Obama said. "Ain't no black people in Iowa! Something big, something new is happening. Let's build the future we all know is possible. Let's show our kids that America is ready for Barack Obama right now." 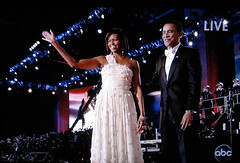 ....Michelle Obama's remarks were also peppered with references to Coretta Scott King and the Rev. Martin Luther King Jr., whose 79th birthday is Tuesday. She said that should Barack Obama win in November, "America will look at itself differently and the world will look at America differently."